This healthy dessert recipe is the perfect snack for kids. 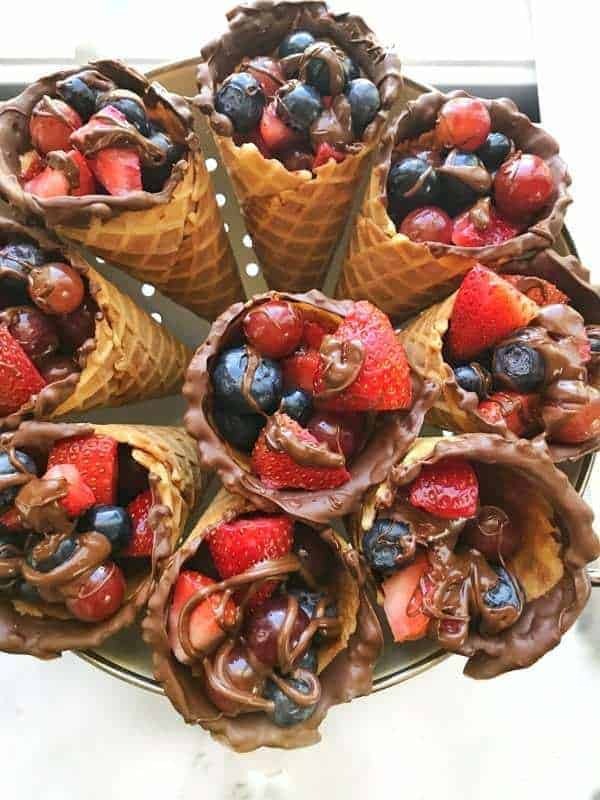 Fruit waffle cones are dunked in chocolate for a fun after-school snack idea, or healthy dessert idea to bring to your next party! The first time I planned a birthday party for my son with his friends is a moment I’ll always remember. Finding appropriate healthy snacks for kids that both he and I could agree upon was challenging, to say the least. Then I came across this fun recipe for kids and we both agreed it was a keeper. Imagine 15 nine-year-old boys swimming at the local high school. Laughing, playing, swimming, tired and hungry. 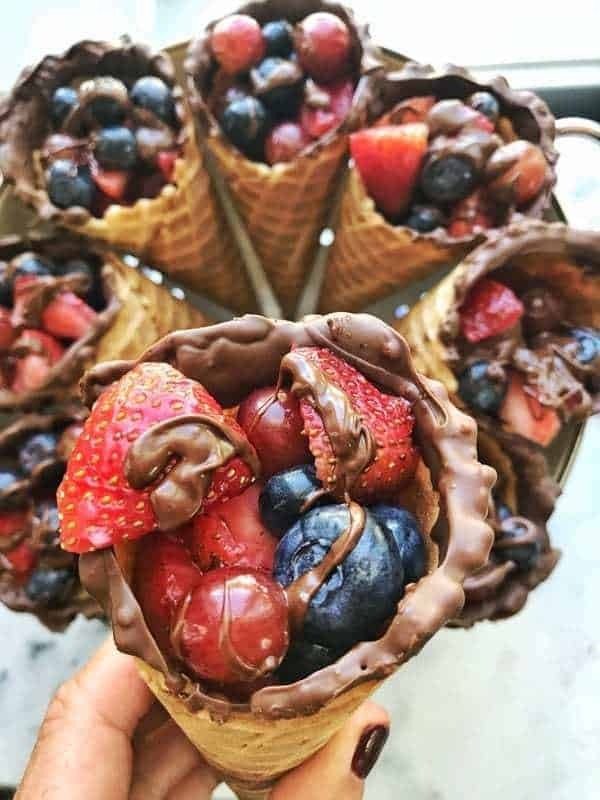 Now imagine a crockpot of sloppy joes, a bowl of potato chips, and dish of lovely fruit waffle cones. Guess what was devoured first? I’ll give you a hint… it wasn’t the chips. I was so impressed, I kept watching. Boy after boy grabbed the fruit. In fact, I left with 2 unopened bags of potato chips and tossed half a bowl of chips that went uneaten. We ran out of fruit. Fun food presentation can really help get kids eating foods that are good for them. We all eat with our eyes first. When something looks great we want to bite right in, but if it is a lump on your plate it is not so appetizing, is it? Appearances matter. Think about this next time you want your kids to eat foods that are unfamiliar to them or are not their favorites. Check out this article for some more fun ideas on food presentation or click here to find more healthy snack ideas. Fast forward 2 years. It’s now summer and I am in need of a quick healthy dessert idea. My son had a house load of boys over. 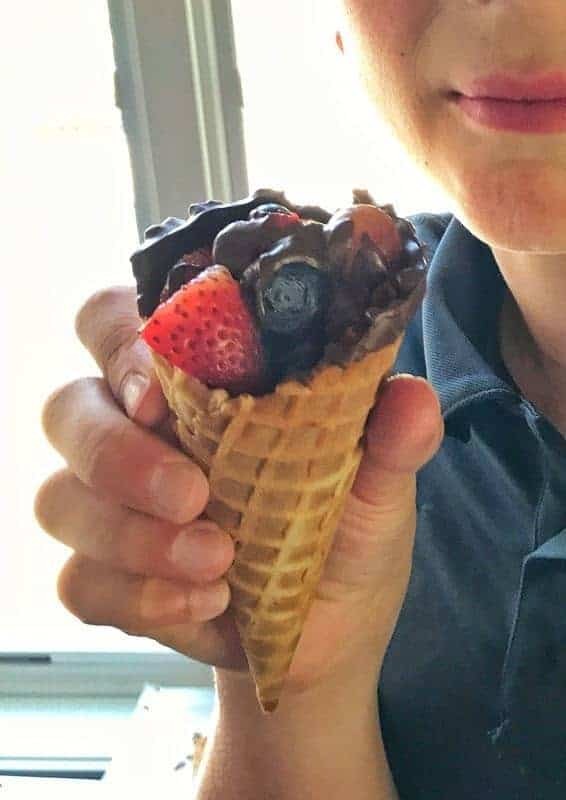 My 9-year-old daughter was excited to make a healthy dessert recipe fun for the boys. 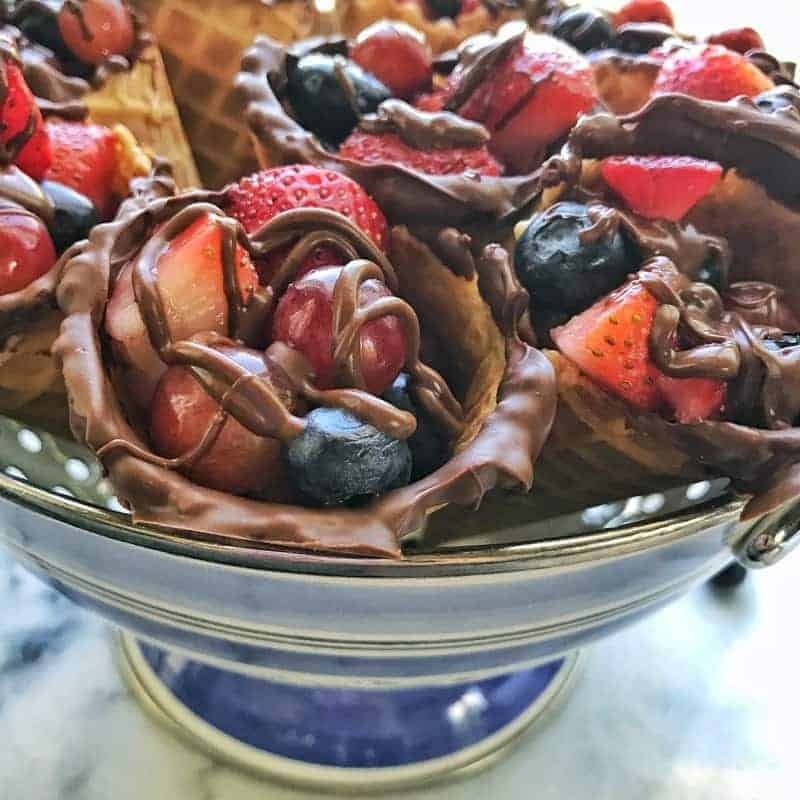 Watch to see how much fun she had making this quick healthy dessert! Try this for an after-school snack idea this year. Your kiddos will love it! To display this fruit dessert, I used a strainer with holes in it. Worked perfectly! This quick healthy dessert idea is the perfect healthy snack for kids. 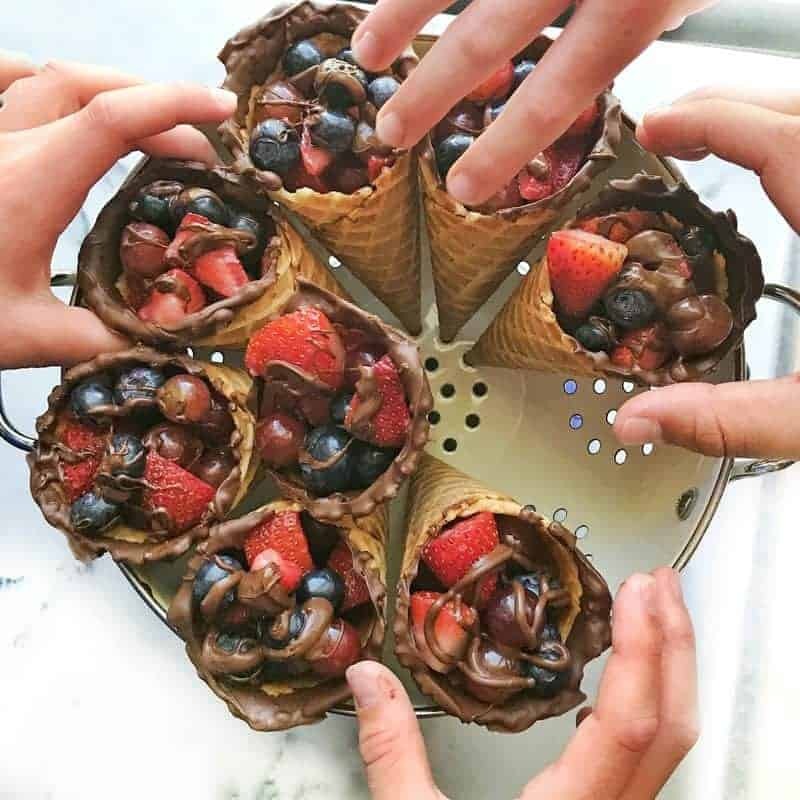 Fruit waffle cones are dunked in chocolate for a fun after-school snack idea, or recipe for kids to make any time of the day. In a medium-sized bowl, add chocolate chips and butterscotch chips. Microwave for 1 minute then stir. Continue to microwave in 20-second increments, stirring each time, until melted. 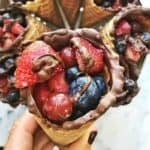 Dip waffle cone into melted chocolate and set aside on a tray lined with wax paper. Repeat for all cones. Set aside and let chocolate dry. Have children use a wide mouth straw to remove strawberry stems. Slice strawberries with a kid-friendly knife. Mix strawberries, grapes, and blueberries in a medium-sized bowl. 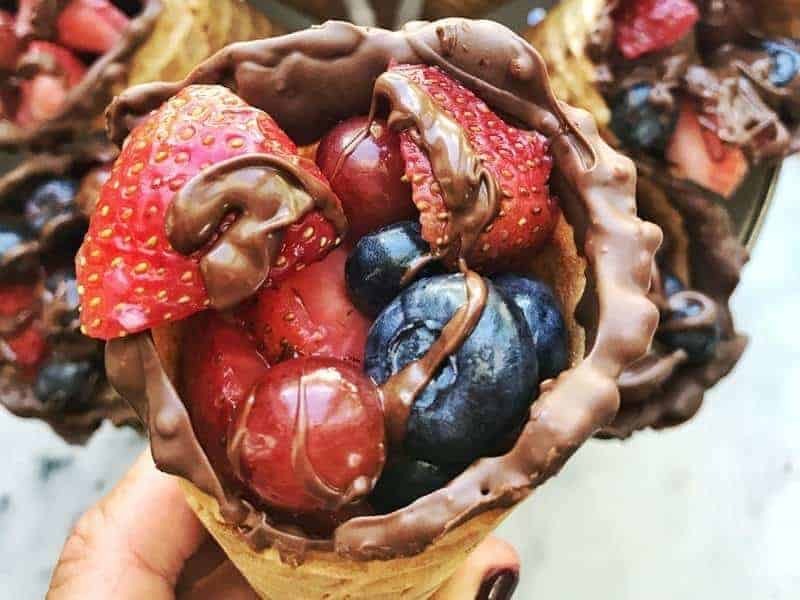 Spoon fruit into waffle cones, once the chocolate is dry. Drizzle with leftover chocolate sauce. Reheat chocolate sauce if it has hardened. To display cones, use a strainer to stand them upright. To help chocolate dry quicker, place the tray in the freezer for 10 minutes. We are making these frequently. My kids and their friends love them! Thanks, Maggie! They really are delicious – and simple too!